Today we talk about LG L35 smartphone, its specs and features. Also, you can find here LG L35 firmware and tutorial how to flash it. Before we start flashing, let’s recall main features of LG smartphone. In 2014 the South Korean manufacturer LG introduced the third generation of its L-series, which included budget device - LG L35. Although it has quite modest specifications list (for modern smartphone), it can be very interesting for many users. The screen diagonal is only 3.2 inches. It sounds funny now, but earlier smartphones were supplied with such screens, and everything that has more diagonal called very big. However, LG L35 is designed for those consumers who use Internet to communicate in social networks, rather than navigating through the browser. In short - the screen is not the selling point; it is rather the weakest side of this smartphone. As for performance, it was really good – dual core platform Qualcomm Snapdragon 200 with 512 MB of RAM should be enough for most everyday tasks (calls, social networks, applications, etc.). Moreover, it was installed the latest Google Android 4.4 KitKat. Thanks to all these features, LG L35 has collected a large number of fans. They still use the smartphone and update it to the latest firmware version. Therefore, we have compiled a complete list of available LG L35 firmware. Also you can find instructions on how to flash LG smartphone on our website, or read it by this link. 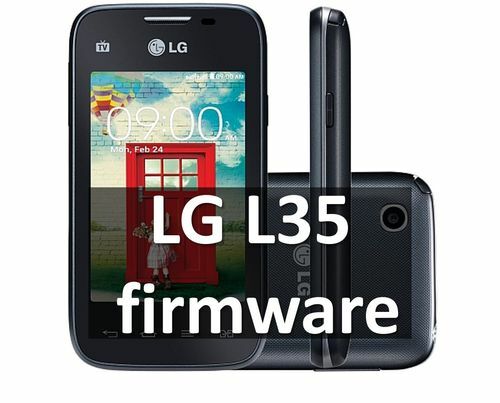 Click the link above to find the latest firmware for LG L35. Here is firmware for different regions and phone models. If you have any problems with LG L35 firmware or flashing, write in comments below, we will try to help you.